But Amtrak is seeing increased demand for walk-on bike service across the United States. In California, demand for bike accommodations has been so overwhelming that Caltrans and Amtrak recently added a reservations system for walk-on bike service for the Pacific Surfliner. Before the policy, if too many passengers wanted to bring bikes on board, they were bumped or, at best, forced to hold bikes in the aisle. Passengers in some states are still struggling to have non-folding bikes allowed on board at all. New York lawmakers are pushing Amtrak to allow walk-on bikes on additional routes out of Penn Station, saying it will boost tourism income for upstate New York. A coalition of lawmakers, including U.S. Senator Chuck Schumer and New York State Senators Betty Little and Brad Hoylman, held a press conference yesterday urging Amtrak to include bike cars on two lines — the Adirondack and Ethan Allen — serving the upstate area and beyond. Dan MacEntee, a spokesman for Little, said that many New York City residents, as well as many international tourists to New York, do not have access to cars. They might visit the Adirondacks or northwestern parts of the state in the summer but don’t have a convenient method of transport. Little has been advocating for walk-on bike service on Amtrak trains for years, and local bike groups and chambers of commerce around the state have been demanding it. The Saratoga Chamber of Commerce has so far collected more than 500 signatures on its petition to Amtrak President Joseph Boardman advocating for bike access on trains. “We think that it would be a wonderful service for Amtrak to provide,” said MacEntee, adding that Amtrak would reap more revenue from increased ridership. Steve Kulm, a spokesman for Amtrak, said the agency is looking for opportunities to retrofit train cars to allow more convenient bike transport. Kulm said most of the lines that allow walk-on bikes receive additional funding from the state. 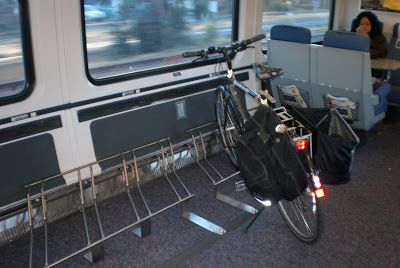 If the state owns some of the train cars, it can design them to accommodate bikes. In the meantime, most folks who want to travel by train will have to leave their bikes at home or seek a different route altogether. Absolutely noty true. See link. The Quincy line (Illinois Zephyr and Carl Sandberg) has had it for at least the 25 year I’ve been using the service. Bikes show up on the reservation website as a supplemental accomodation, like business class or sleepers on a long distance train. Why not? I took the Lake Shore Limited from Illinois to Buffalo-Depew, biked to Albany, and returned by the same train. I had a folder and the other 5 in the group had full sized bikes. Amtrak employees in both Chicago and Albany went out of their way to accomodate us.